My argument has nothing to do with wealth producing power; wealth already does lead to power. My argument is about how one’s conscience directs the spending of one’s resources. In the past it was our bodies that were conscripted for war, but modern wars are fought largely with very expensive machines directed by a few professional military personnel. (Just think of the cost of the F-35 jets your government is still considering buying. The expenditure being considered for these machines could pay for the transit needs of all of the major cities of Canada with money left over for affordable housing for all plus universal daycare.) Therefore in modern times, people of conscience are resisting paying the taxes that pay for war and war preparations. That is what we are doing. With respect to one’s conscience, Canada’s Charter of Rights and Freedoms, Article 2 says, “Everyone has the following fundamental freedoms: (a) freedom of conscience and religion;” So it seems that the dictates of a Canadian citizen’s conscience takes precedence over a concern that wealthy people would have a greater say in the running of Canada. Again, research indicates that the rich are more powerful by other means including a tax system that has become less and less progressive over many decades. 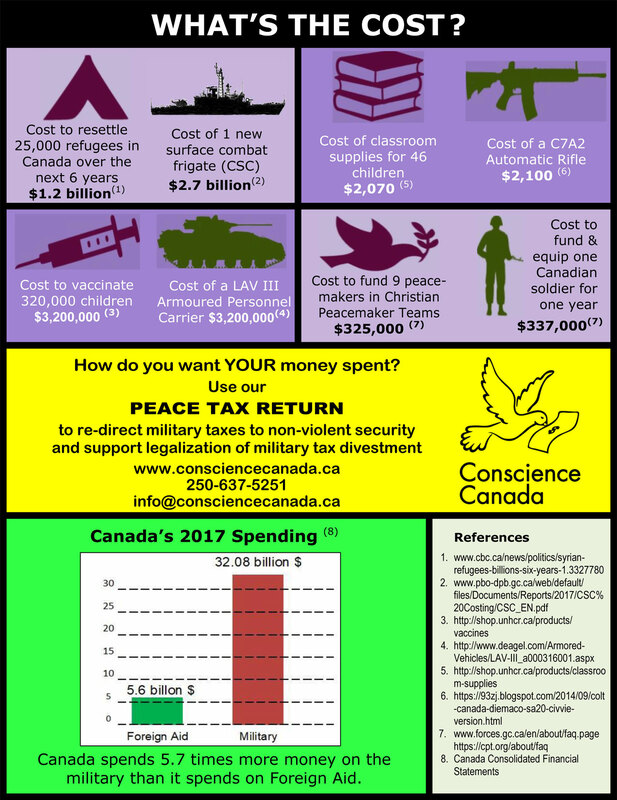 An additional argument I offer and perhaps the strongest one, is that there is a history and tradition in Canada (and elsewhere) that allows Conscientious Objectors to opt out of war service on the basis of freedom of religion and conscience. I direct you to A Brief History of Conscientious Objection in Canada. 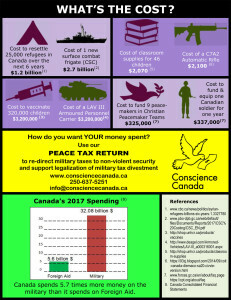 In this short article, Dr. Don Woodside describes how governments in the area that would become Canada, have allowed exemptions from military service since 1793 to members of traditional Peace Churches – Mennonites, Brethren In Christ, Quakers, Doukhobors and Hutterites. He writes, “Since 1978, the focus has shifted to war tax resistance, as we are in an era in which citizens’ taxes, rather than their bodies, are conscripted.” Going back to WWI, and before, citizens of all religions and no particular religion in the countries involved in that war have asked to be excused from participating in and paying for war. This tradition must take precedence over other considerations when it comes to the paying of war taxes.